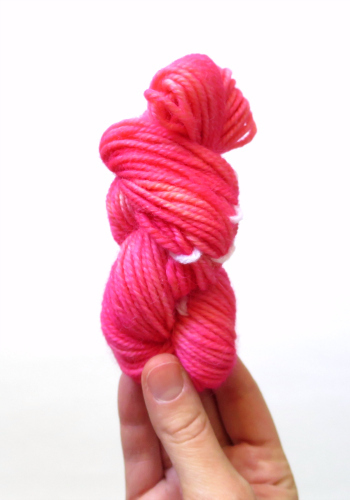 This is the second post in a series I am doing on how to hand-dye yarn using food colouring. 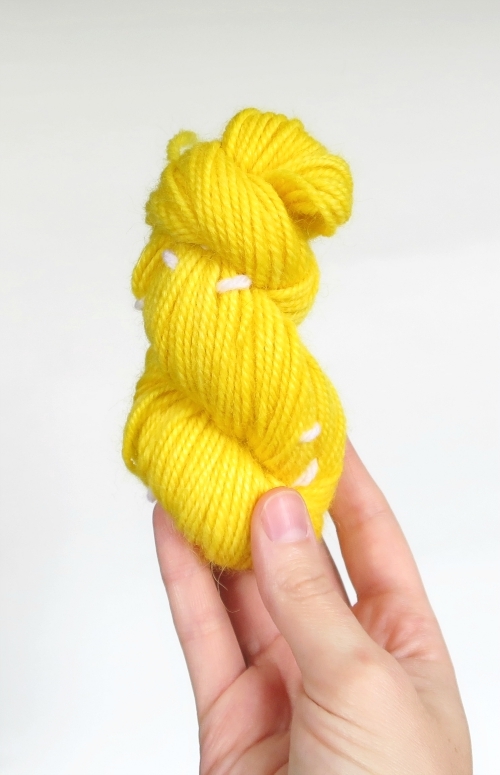 Previously, I harnessed the heat of the sun to dye a small skein of yarn bright yellow, and this time I am going to show you how I used a slow cooker to dye my yarn pink. If you missed the last post on hand-dyeing, make sure you read at least the first section on the basics of dyeing with food colouring and how to prepare your yarn. 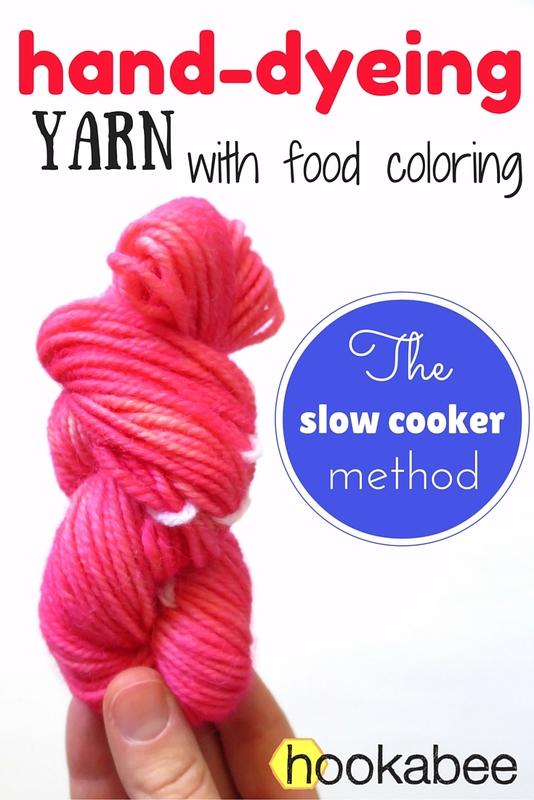 Dyeing yarn using a slow cooker is much like the sun method because you don’t have to monitor the yarn continuously and it takes a longish amount of time. You can set the yarn and dye up in the cooker and leave it be while you go about your day – so super easy! This time I chose the pink dye from my box of 12 Wilton Icing Colours to dye the little 25 g skein of alpaca wool yarn I had made last time. I pre-soaked my yarn for about 30 min in a bath made up of vinegar (2 tsp) and water (2 cups). I used these volumes because my dye is pink (so needs less vinegar than blues, see DyeYourYarn.com), and the total volume was able to cover my yarn fully. In a glass measuring cup, I mixed 2 cups of water with 2 tsp of vinegar and some Pink Wilton icing dye. I just estimated the amount of dye, but used no more than 1/4 tsp because I didn’t want extra, and therefore wasted, dye that wouldn’t be taken up by the yarn. I based this on the info found on the DyeYourYarn.com site for Wilton dyes: “[Use] 1/16 teaspoon Wilton® Icing Gel on .2 oz Lion Brand® Fishermen’s Wool. This amount of gel produces a saturated dyebath. Using more gel will leave food color in the dyebath that will not bond.” With the Wilton’s concentrated gel, I did find I needed to wisk the solution for some time before it was less clumpy, and even then there were little bits that were still concentrated. Next, I poured my dye solution carefully into the slow cooker and then transferred the wet yarn from the pre-soak bath into the cooker. Before you transfer your yarn, make sure that your two baths are not drastically different in temperature. This reduces the chances of your yarn felting. Finally, I placed the slow cooker’s lid on and set it to high. I then kept checking the slow cooker every so often to see how the yarn was doing. You want to leave it until the dye bath is clear – this means all the dye has been taken up by the yarn. I started at 11:00 am and left it in until 3:00 pm, but I think I could have taken it out earlier. Once I noticed the solution was clear, I removed the yarn and placed it in my glass measuring cup and waited until it had cooled down before rinsing it to remove any excess dye. You don’t want to suddenly rinse your hot yarn with cool, or even warm water, because this may cause your yarn to felt. Once rinsed, I gently squeezed the excess water out (actually, I used my salad spinner and it worked really well!) and hung the yarn to dry outside in the shade. And that is it! Once my yarn had dried I twisted it into a little skein and admired my work. How does it compare to last time? This skein is dyed less evenly and is less saturated than my yellow skein, but that could be because I didn’t touch the yarn once I started the dying process. When I used the sun method, I shifted the jar every so often to make sure the dye was getting in everywhere – this time I didn’t. Also, there is a greater difference between the dye colour and the original yarn colour, so I can see more clearly where the dye did and did not take. I maybe could have used more dye to create a more saturated colour, but I really like the more mottled effect that was created; it reminds me of pink lemonade! Next method: Stove top dyeing! What yarn do you use for amigurumi? You aren’t going to be wearing your amis; you may give them to kids, who aren’t always gentle with them; or they may just sit on your desk all day, keeping you company. The yarn you choose to make a garment is completely different from what you may choose to make your amigurumi. But at the same time, you also want to enjoy using the yarn when you are crocheting – you want it to feel good in your fingers, not split or fuzz up easily – or the experience of making the ami won’t be very enjoyable. I think one of the most common fibers used to make amigurumi is acrylic – it is cheap, durable, washable, and comes in a wide variety of colours and textures. One of my go to acrylics is Vanna’s Choice by Lion Brand. When I first saw this yarn, I didn’t think there was an actual link between the Vanna White of the American game show Wheel of Fortune and this yarn. I thought it was just a coincidence, but no! This yarn actually is by THE Vanna White of Wheel of Fortune! Vanna loves to crochet and has been working with Lion Brand since 1985. You can watch her on YouTube talking about yarn and crochet, such as this one on how she learned to crochet. I don’t buy this yarn because it is her line, but I do find it interesting, and a little amusing! What do I like about Vanna’s Choice yarn? (1) Easy to find – You can find this yarn in most large retailers that have yarn, including Michael’s and Walmart, as well as multiple sites online. It is not exclusive to one store, so you can always get it when you need it. (2) Good price – Though this yarn is more expensive than other acrylics, such as Red Heart Super Saver, it is still relatively cheap compared to other yarns, and I feel the higher price does give you a better quality yarn. 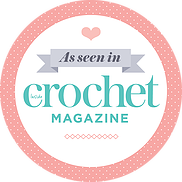 (3) Nice to crochet with – Compared to other, cheaper acrylics, I like the way Vanna’s Choice yarn feels in my hands when I am crocheting. It is soft and lofty with a bit of stretch – so it is enjoyable to work with. Compared to cotton (another popular fiber for amigurumi), which does not stretch, that slight give is nice when crocheting. (4) Creates a good fabric for amigurumi – I really like the fabric that results when this yarn is crocheted into an ami, especially my large amis, because it is soft, squishy, and huggable. I find it doesn’t stretch as much as wool does, so keeps its shape better and results in smaller stitch holes. And while it is soft, it doesn’t pill or fuzz easily, so wears well with time. (5) Not too much sheen – I sometimes go back and forth about whether I like my yarn to have a sheen, or shininess, to it or not, but Vanna’s Choice sheen is not over the top, so I don’t mind it! This also means it isn’t as slippy as other, more shiny acrylics, so knots and stitches stay put. What don’t I like about Vanna’s Choice? (1) Colour choices – Unless you can find the baby version of this yarn (which I can’t in stores here in Canada), there are not many bright and vibrant Vanna’s Choice colours. All the colours in the collection have been selected specifically to match each other really well, which is nice, but I find the tones limited. I love bright colours, and sometimes I find this yarn a little dull in that department – except the blue I use for Walden the narwhal! I could not find a nice bright, sunny yellow for Bobby the bee, or a nice Easter violet for Flora the bunny. (2) Inconsistencies – You have to be very careful and purchase enough yarn in one lot for a project because there is a noticeable difference between dye lots. I had bought blue for Walden on two different occasions and I could not use up the old yarn and combine it with the new skein I had purchased later because they were too different. There was not only a difference in colour, but also a slight difference in texture and feel. Also, make sure you read the label of each colour and confirm how much yardage you are getting per skein – some colours have less yardage than others! (3) It’s acrylic – Despite all the qualities that I like above, Vanna’s Choice is still an acrylic yarn and has all the negative aspects of acrylic fibre – it isn’t environmentally friendly and does not have the same feel that a natural fibre has, and can still feel a little “plasticy” in comparison. Do you use Vanna’s choice? Is there another acrylic yarn you prefer more? Or do you stay clear of acrylic yarn all together? I would love to hear from you! I have wanted to dye yarn for a while now. Playing with colour and creating unique yarn that is all your own doing – so much fun! I researched different dyes, including acid dyes and natural dyes, but decided my first experiments would be with the safe and easy food colour dyes. 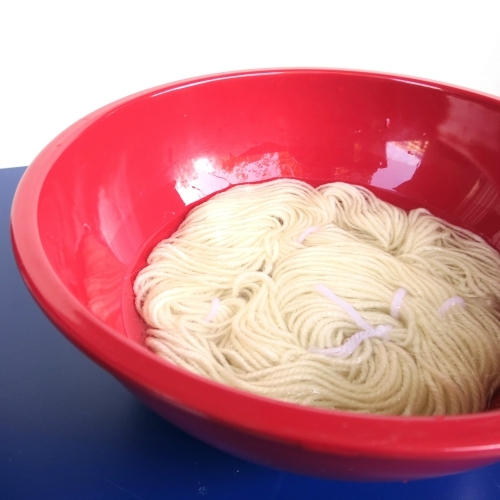 This post is the first in a series of tutorials on how to dye yarn with food colouring, each demonstrating a different method: using the sun, microwave, stove-top and crock-pot (slow cooker). Each method has one thing in common: HEAT. Heat is required for the dye to bind to your yarn and is necessary when hand-dyeing. Today’s method – using the SUN! But first, some prep work. What yarn can you use? Your yarn needs to be made up of animal fibres, such as wool, alpaca, angora, or cashmere. Silk and nylon supposedly also work with food colouring, but I have not seen an example. Acrylic yarn and yarn made up of plant fibres, such as cotton and bamboo, will not work – the dye will not take to these yarns. 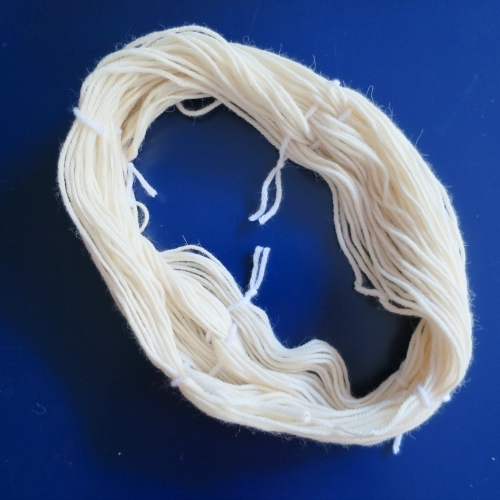 If you want more of a pure colour that is most like what the dye looks like in the dye bath, you will want to use white yarn, but dying coloured yarn also works and you will get a different effect. I have chosen an alpaca and wool blend with a slight cream tone (Berroco Ultra Alpaca #6201). What dyes can you use? You can use any food colouring, such as those classic little dropper bottles, icing dyes, Easter egg dyes, and drink powders (eg. Kool Aid – but make sure there is no sugar added). I picked up the 12 pack of Wilton Icing Colours and will be using them for my experiments. 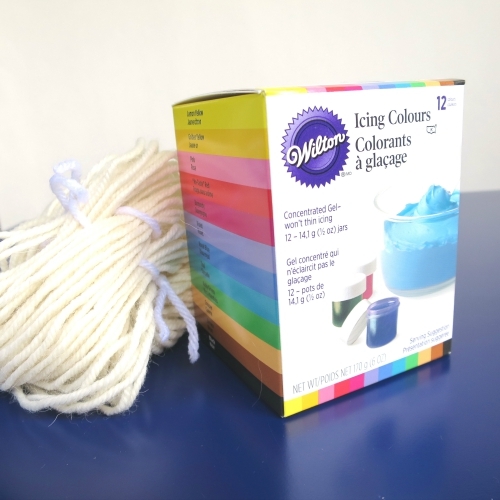 Wilton dyes are concentrated, so you don’t need very much, there are many different colour options, and you can find them easily in your local craft store (and use a coupon!). If your food colouring does not have an acid already included, which is most dyes except Kool Aid (already has citric acid), you will need to add vinegar (or other form of acid) to your dye bath. How much vinegar do you add? I am following the ratios found on the website DyeYourYarn.com (a very helpful website, by the way! ): “a teaspoon per 8 ounces [of] water for reds and yellow and a tablespoon for blues”. For my first time dyeing, I decided to keep it simple and make a skein of yarn all one solid colour. There are many different ways to prep the yarn to create different effects, such as colour gradients and multi-tonal results. In the future I want to experiment with different techniques, but I am sticking to simplicity for now! Preparing the yarn is the same for each method of dyeing. You want your yarn to be loose so that the dye can penetrate all the fibres (especially if you want a solid colour), but you also don’t want a big tangled mess of yarn in the end. 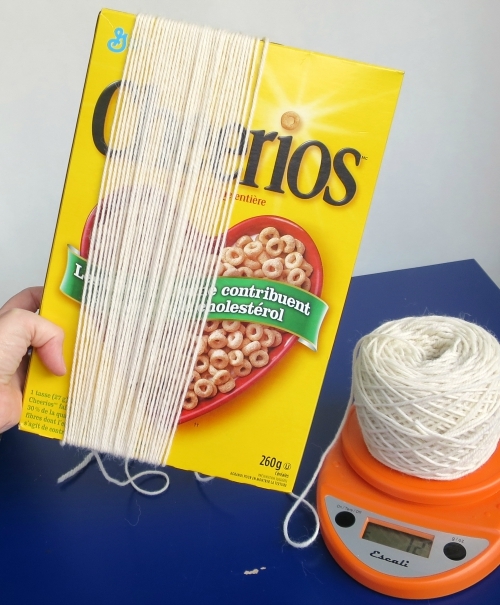 I divided my 100 g skein of yarn into four 25 g skeins using my weigh scale and a cereal box. 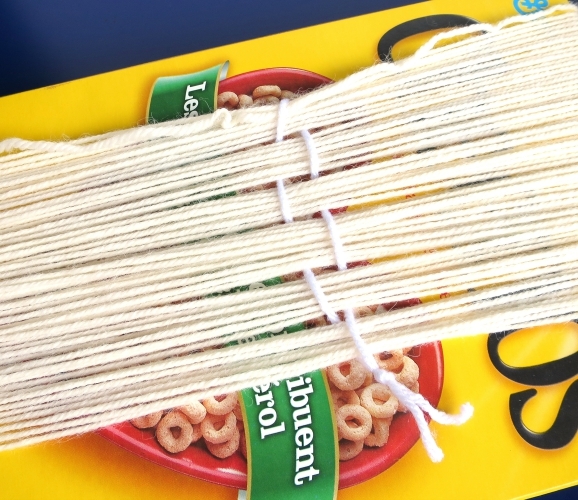 I was able to use a cereal box because my skeins weren’t very large, but you may want to use something else to wind yours, such as the back of a chair, if you want a larger skein. I simply placed the yarn on my scale and wound one end around the cereal box and stopped when the yarn on the scale was 25 g lighter. You want to wind the yarn in one layer, to prevent tangling. Once I had the 25 g wound around the box, I tied the yarn in four different spots by weaving a piece of acrylic yarn through the strands. I used white acrylic yarn so it would not absorb any of the dye from my dye bath or bleed any colour onto the yarn I was dying. The weaving through the yarn prevents the yarn from becoming tangled as you handle it for dyeing. Next, I slipped the yarn off the cereal box and had a circle of yarn that was ready to be dyed! This is a step where you can experiment with different methods. You can pre-soak your yarn before dyeing, or you can add your yarn dry to the dye bath – each method will create different effects. You also need to decide whether you want to add vinegar to the pre-soak bath or not. You don’t have to add it to the pre-soak bath. I had read that adding vinegar at this stage results in yarn with a more solid colour, so that is what I chose to do this time. 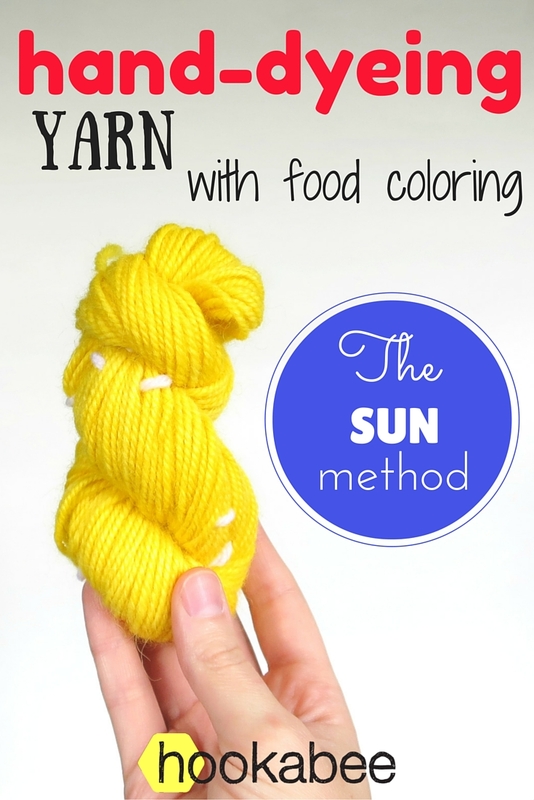 The idea of using the sun to dye my yarn came about when I read this post on Kool Aid Yarn Dyeing on the Knit One, Blog Two site, but I didn’t follow their protocol completely. I pre-soaked my yarn for about 30 min in a bath made up of vinegar (2 tsp) and water (2 cups). I used these volumes because my dye is yellow (so needs less vinegar than blues, see DyeYourYarn.com), and the total volume was able to cover my yarn fully. In a one pint mason jar, I mixed 1.5 cups of water with 1.5 tsp of vinegar and some Lemon Yellow Wilton icing dye. I just estimated the amount of dye, but used no more than 1/4 tsp because I didn’t want extra, and therefore wasted, dye that wouldn’t be taken up by the yarn. I based this on the info found on the DyeYourYarn.com site for Wilton dyes: “[Use] 1/16 teaspoon Wilton® Icing Gel on .2 oz Lion Brand® Fishermen’s Wool. This amount of gel produces a saturated dyebath. Using more gel will leave food color in the dyebath that will not bond.” With the Wilton’s concentrated gel, I did find I needed to wisk the solution for some time before it all completely dissolved and was no longer clumpy. Next, I transferred the wet yarn from the pre-soak bath to the jar, closed the lid, and set the jar in the sun! Make sure that your two baths are not drastically different in temperature when you make the transfer. This reduces the chances of your yarn felting. I then kept checking the jar every so often to see how it was doing. 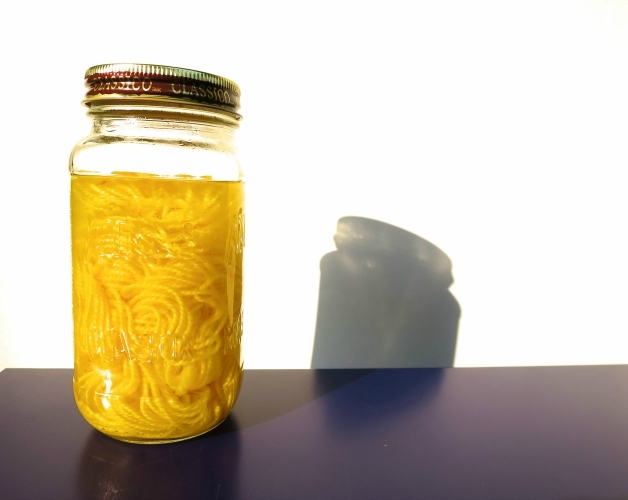 You want to leave the jar in the sun until the dye bath is clear – this means all the dye has been taken up by the yarn! I had my jar outside in the sun at 10:30 am, and it took until the late afternoon for it to become clear, but the duration will vary depending on the weather. When you check up on your yarn, you can shift the yarn around gently in the jar to make sure it dyes evenly, unless you want a more mottled effect, in which case leave it alone. Finally, once the solution was clear, I removed the yarn, rinsed it so that any extra dye was removed, and then hung it to dry outside in the shade. When handling the yarn while rinsing, make sure you are gentle and don’t agitate it too much or wring it dry or your yarn may felt. Next method: slow cooker dyeing!